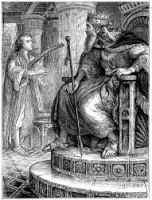 For the first year after Samuel anointed him king, Saul had a very limted rule of Israel. But the Saul Bible story continues in the seond year of his reign, with Saul beginning to organize an army in an attempt to shake off the Philistine yoke. Driving back the Philistines to their own country placed Saul in a position higher than that of any previous ruler of Israel, and he made war upon the neighboring tribes. 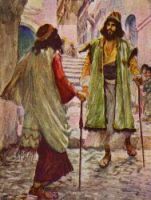 His impetuous zeal resulted in him receiving two curses from Samuel, and almost cost him the life of his son, Jonathan. The rest of Saul's life is one long tragedy. The frenzy which had given indications of itself before, at times took almost entire possession of him. 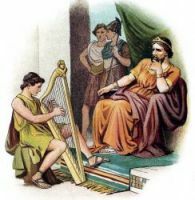 In this crisis David and his music were recommended to Saul. From this time forward their lives were intertwined. In Saul's better moments he never lost the strong affection which he had for David. But his jealousy and acts of fierceness increased. On this page you'll find eight Saul Bible pictures from my personal book collection. You're welcomed to use these Saul Bible drawings in your art projects. 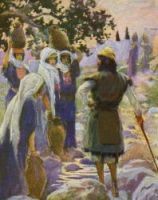 Click on the Saul Bible illustrations below to see more details about saving a free Saul Bible image or about purchasing the images of Saul from the Bible at a higher resolution.